Crimson Trace LG-438 Laser Grips for Sig Sauer Sig Pro Series FREE SHIPPING! 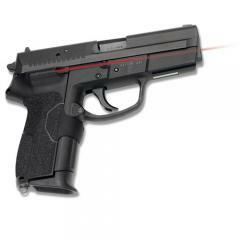 Improve the accuracy, speed and effectiveness of Sig Sauer Sig Pro Series pistols with Laser Grips from Crimson Trace. Featuring a rubber over-mold and innovative laser technology, the tactical upgrade is ideal for shooters of all levels and walks of life. The laser's low-profile design hugs the pistol's grip, offering an effective side mount that does not hinder quickdraws or holstering capabilities. Its rubberized construction feels comfortable in the hand and improves the shooters overall gripping power. A front activation switch instantly activates the laser from a natural shooting position, offering near instant target acquisition the moment the weapon is drawn. The .5-inch red dot is factory-sighted at 50-feet and accommodates adjustments to windage and elevation for greater tactical application. ©2002-2019 CopsPlus.com: Crimson Trace LG-438 Laser Grips for Sig Sauer Sig Pro Series FREE SHIPPING!